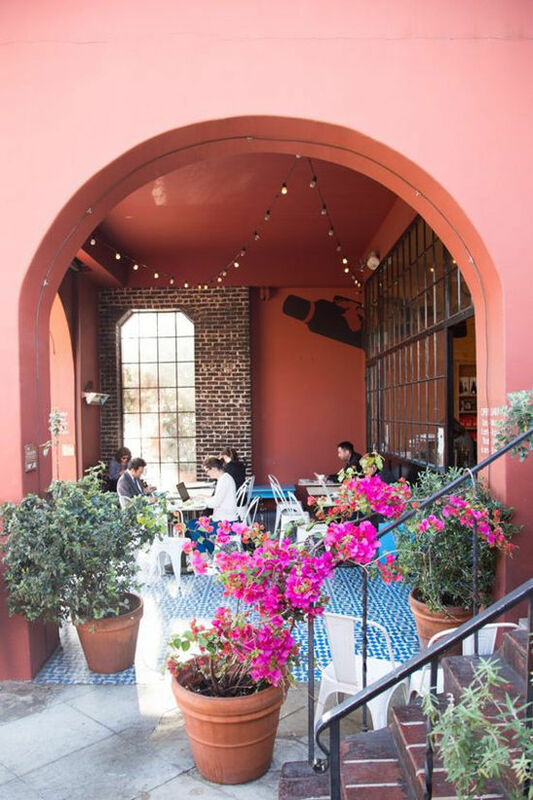 a classic los angeles coffee shop that coined the phrase, “but first coffee” they have multiple locations but the melrose place shop is my favorite. i order and recommend the half sweet vanilla latte. and they sell pressed juice. simple, straight forward coffee shop. they have wifi and outdoor seating. 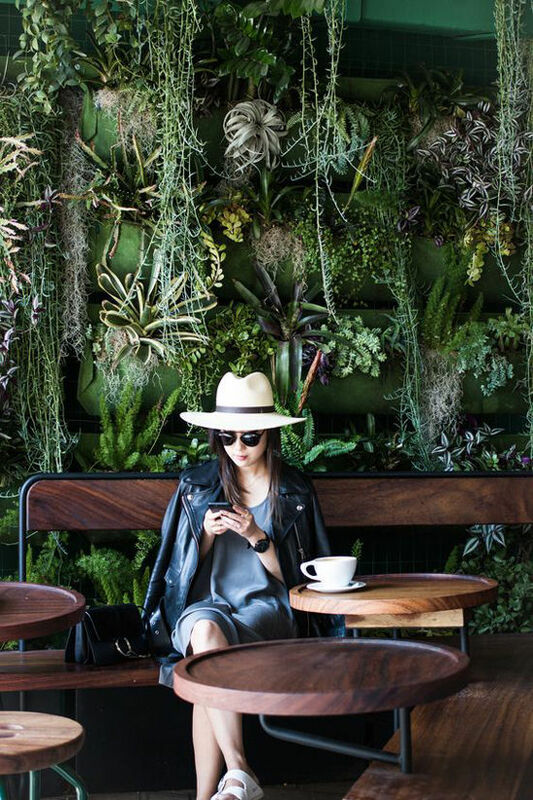 if you’re looking for an instagram the plant wall in the back of the shop is calling your name. forget the coffee and go for the hot chocolate with the marshmallow. small, not the best place to sit and hang but they have excellent pastries, a really good chocolate chip cookie and their coffee is delicious. the little sandwiches and quiches are amazing too. 5. CAFÉ DE LECHE | highland park. easy neighborhood spot. order the horchata espresso. plenty of seating but be warned, there is wifi only on weekdays. they have a great food menu, delicious homemade almond milk, a really pretty tile floor for photos and plenty of sitting but, no wifi. dirty chai is my drink of choice. 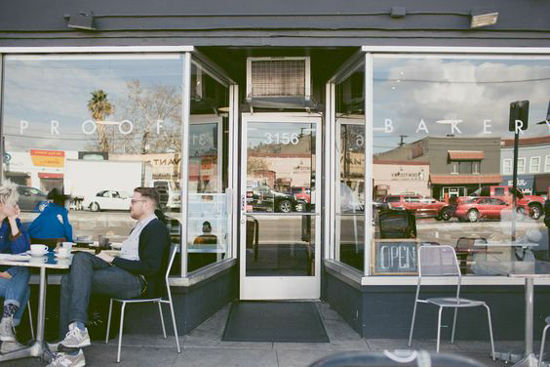 a local favorite in echo park, good ambiance, nice outdoor seating and good food (especially salads) to pair with your coffee. a classic, almost always crowded (unless you go before 8:30am) but i think they have the best pour-over coffee in town. this joint is on the pricey side. oh, and they have the tile floor that you’ve seen a thousand times on instagram. 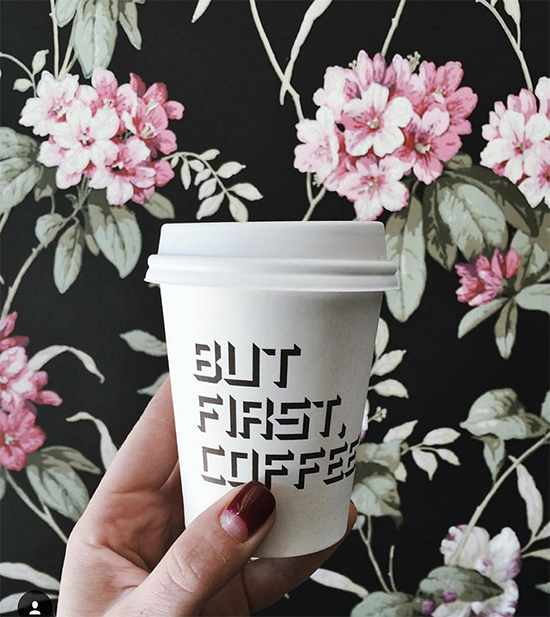 grab a coffee and peek in the flower shop next door. they roast their own beans which makes for a great vacation souvenir, friendly service, wifi and good coffee. i just really like this place. love their breakfast food, nice variety of beans and not filled with snobby people. they also have two other locations that are both great. tiny but worth a visit if you’re downtown, homemade almond milk, beautiful avocado toast and nice baristas who know how to make a killer latte. and they have the guerrilla taco truck out front on fridays. this place is a home run: beer, wine, coffee, awesome food, friendly staff, wifi – what more do you want? their almond macadamia nut latte forever and ever. also, their toast game is strong. the best (and most reasonably priced) drip coffee in town. the perfect place to study/chill at with their reliable wifi and really good cold brew, must try their signature document cold. try a their green tea latte or siphon coffee! when you’re shopping at the grove and you need a break this is the place. they have the best almond croissants. it’s just a walk up bar nestled into the farmer’s market area but there is sitting around it. 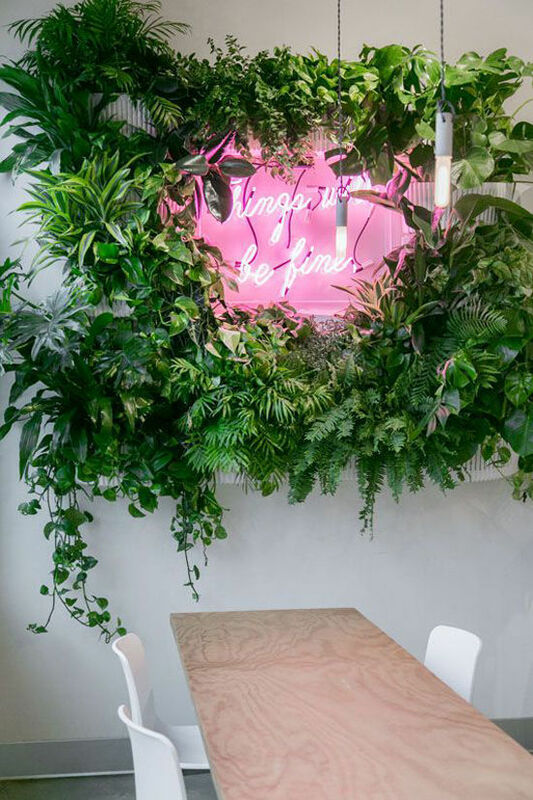 an instagram worthy coffee destination that also sells juice if you’re already over-caffeinated. what do you think, are we missing any? what would you like us to round up next? brunch, shopping, dinner, healthy spots? we are all ears on this new column! their new orleans style iced coffee is the best and the echo park location serves a full breakfast and lunch menu and it’s delicious. try the avocado toast! and the BEST almond milk latte in the city. 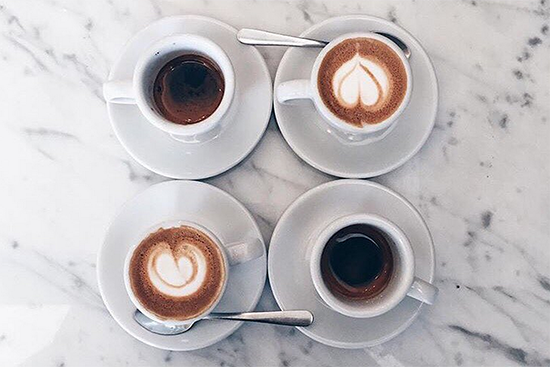 always on the hunt for the best almond milk latte! Great list. I love the honey latte at Lo/Cal. Cafecito Organico on Hoover in Silverlake! It’s tiny and there’s only outdoor seating, but they roast their own beans and it’s gooood coffee. I love Javista on Sunset, and new one Rubies + Diamonds on Sunset. So glad your doing this! I was coming out there in February for first time and wanted to know of good coffee places! Also great things to see and do there. Places to eat! Email me any more recommendations you might have! Would greatly appreciate it! You should check out Bow Truss! Awesome beans and thoughtful baristas. 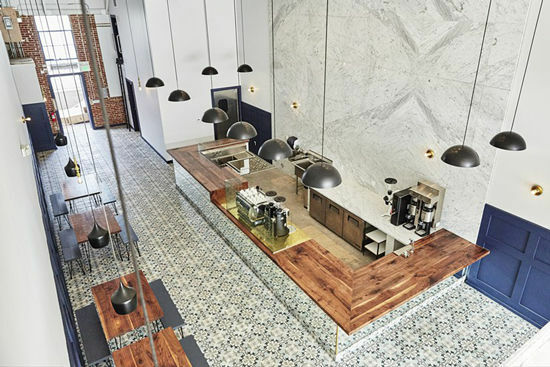 The new location at 340 N Camden is the first one to open outside of Chicago. I recommend their single origin natural process Ethiopia Aricha-tastes like straight black cherry goodness. Hi Joanie, thanks for sharing your coffee favorites. 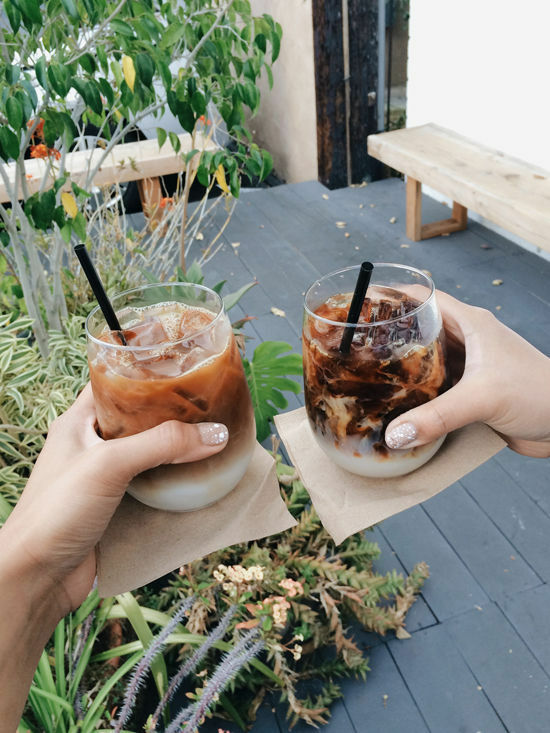 Maybe you girls can do a Weekend in LA Guide where you share your favorite places to stay, shop, dine and hang if you are in town for a shorter visit. 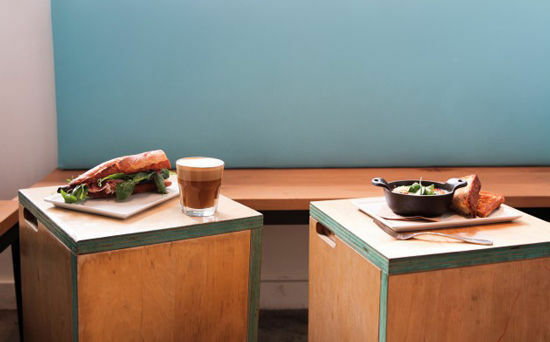 Great picks, I love me a couple of these cafe spots! This post makes me miss LA so much! I loved going on coffee adventures around the city and it’s nice to see a few of my favorite coffee shops. These are great picks, by the way! Okay I have to go to Dinosaur Coffee!!! Love the name! This is so awesome. I have to keep this in my memory bank because I will definitely be in L.A. at some point this year! I want dinner, cocktails and hotels! Please!! added to the list! thanks for the suggestions. Paramount Coffee Project (affectionately acronym-ed “PCP”) is where I get my almond milk latte every morning. Across from Canter’s in Fairfax Village – the nicest Aussies run this establishment, and it’s the only PCP in the world outside of the flagship in Sydney. Xo keep buzzing, gals. Also, Deus Ex Machina in Venice. Quintessential California cool is channeled through the biker/surfer babe vibe. Definitely insta-worthy. Not a coffee drinker but I’ve seen that neon sign everywhere and wanted just to visit this coffee shop just for that! Ooh, LOVE this idea! 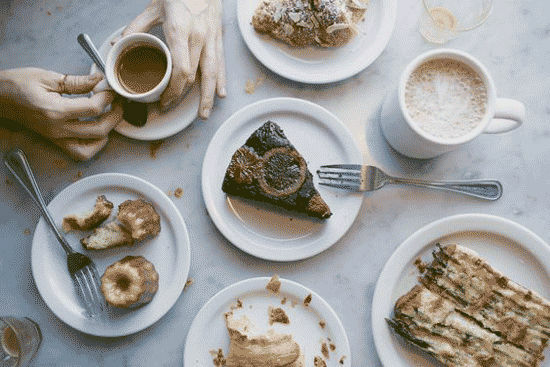 I’d love to see suggestions for brunch spots, places with great views, art galleries, hidden music club gems, and hey… FREE stuff to do in L.A. Thanks! 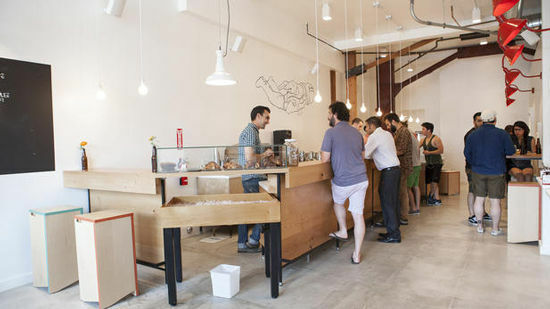 I would suggest Blue Bottle in Venice! It’s tiny but it’s my favorite coffee in LA (despite being a Bay Area chain). The NOLA cold brew is such a treat. I love your fun round-up! I’ve only been to LA once, and it was only because I flew into LAX for a wedding in Santa Barbara. But, I’m really wishing we had the chance to check out these spots while we were there! I had the most amazing iced mint matcha latte from Andante last time I was in LA. Seriously incredible! that sounds amazing! i’ll have to try it. Last I heard (and by heard I mean yelped) Dinosaur stopped offering wifi… As pretty as that place is as an experience! I LOVE cafes and am totally willing to pay those LA coffee shop prices, but have to skip this one now because unfortunately not being able to jump on wifi if I need to for work is a deal breaker! Now I happily hand over my daily $5 to one of the many other cafes nearby. I haven’t tried Document or Helio, but they’ll be my next stops! I will love a coffee latte. Great places. Next, how about a brunch? great roundup! live in san diego now and wish i could check out the newer coffee places. copa vida (also in SD now) and home brewed bar in pasadena should be on the list! i can’t believe i forgot Copa Vida! I love that place, thanks for adding! H Coffeehouse in Los Feliz is pretty rad! It’s attached to Home Resturant, smallish, but a popular work and meeting spot with indoor and outdoor seating. They have some awesome looseleaf teas, nitro cold brews, delicious bakery items and toasts, and one of my favorite almond lattes around. Also Trails Cafe in Griffith Park! They make their own almond milk and offer a fab lavender scone. PS. H Coffee also has kombucha on tap! 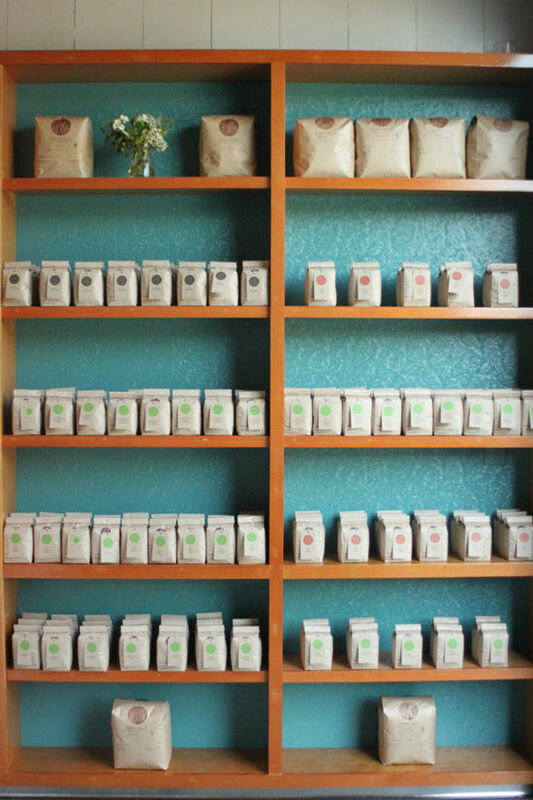 Check out Cognoscenti Coffee or Bar 9 in Culver City. Bar 9 is huge, has lots of light and roasts their coffee in house, and Cognoscenti has a great selection and a fantastic pour over. thanks for the recommendations, margot!